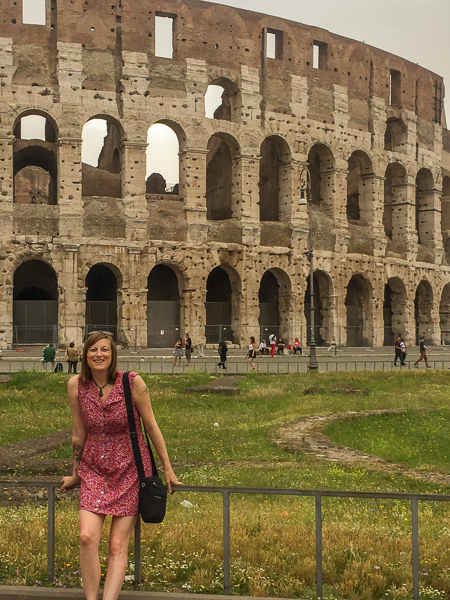 Rome vs Florence — 2checkingout | travel and adventure | Inspiring. Capturing. Experiencing. How do these two heavyweight icons of Italian history and culture measure up against each other? Ding ding, let the fight begin. With our house sitting commitments, we limited ourselves to 24 hours in each city. To maximize our time in Rome we choose to follow several self-guided walking tours from the website rometoolkit. These are easy to download to your phone. We started at the throbbing mass that hangs out at the Trevi Fountain. With a little patience, you can capture a photo or two that doesn’t include the selfie-snapping hoards. We then wove our way to the Pantheon and onto Piazza Navone. The neat thing about the Pantheon is that it’s free of charge, so stepping inside to admire this architectural marvel is a no-brainer. The Pantheon is still in use today as a church, and it is the last resting place of the Raphael, amongst others. High above Rome, The Lighthouse of Manfredi and surrounding area provide a sweeping vista of this great city. Our route down took in the Fontana dell Acqua Paola, almost as impressive as the Trevi Fountain but much quieter. 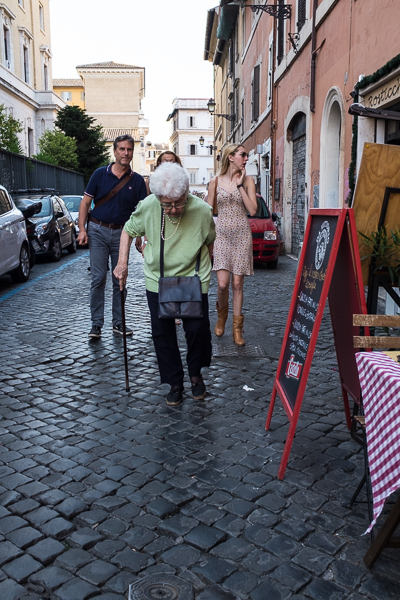 We then descended into trendy Trastevere with its narrow cobbled streets lined with restaurants and bars. It turns out, one of the most popular eateries is a small takeaway serving toasted sandwiches as big as doors. With Julie heading to the airport for an early morning start I wandered over to St Peter’s Square and St Peter’s Basilica. Arriving not long after opening it was super quiet. I was in the minority who prefer sightseeing over breakfast. My jaw dropped as I stepped inside. The craftsmanship and sheer size are mind-blowing. Having drooled my way around the cathedral, I paid the fee to visit the cupola (top of the dome). You can take the cheap option and walk all the way up or for an extra couple of euros you can take a lift part way. Guess which option this lazy boy took? Again I had the run of the dome. 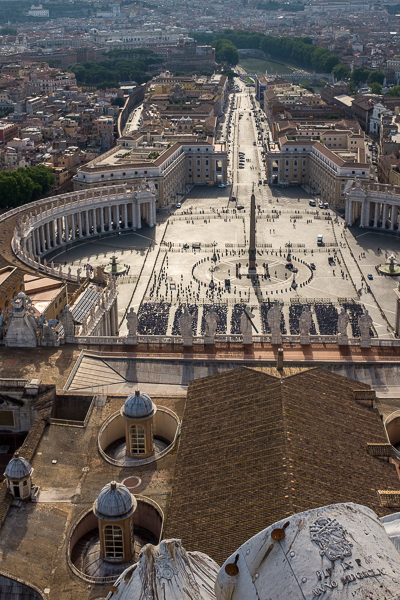 Later in the morning the queues to enter the basilica and cupola stretch all the way around St Peter’s Square. Next stop was the Vatican Museum, home of the Sistine Chapel. It felt as if the whole of Rome was waiting to get inside. The trick here is to book your tickets online. That way you get to walk past all the melting tourists with a smirk on your face. Inside it is bedlam. The narrow corridors are lined with incredible artwork, the ornate ceilings a draw for the gawking visitors. 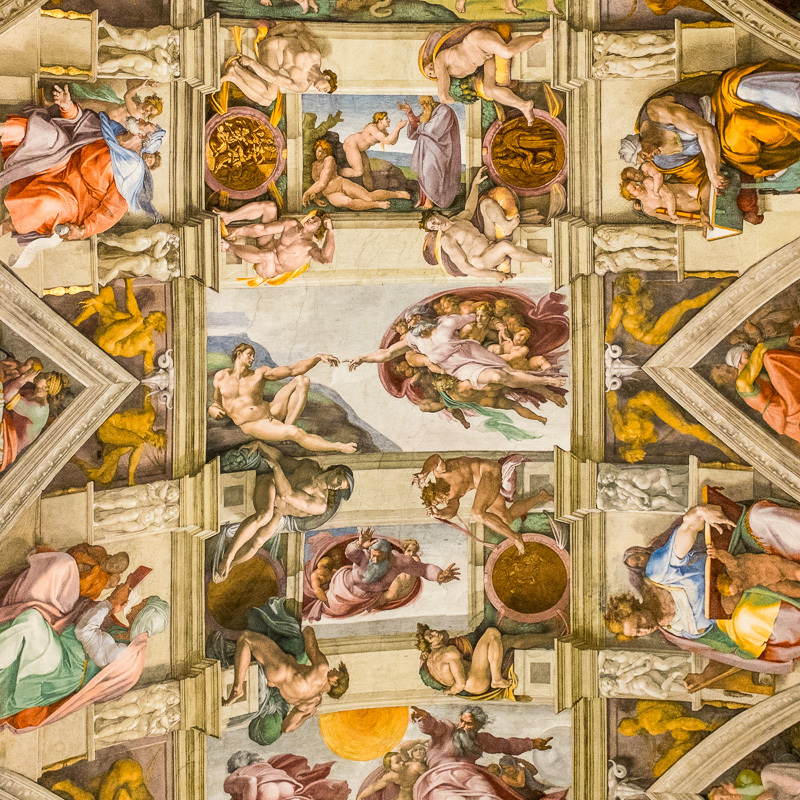 To survive this visual and bodily overload I made a bee-line for the Sistine Chapel. I rushed through several rooms that were bursting at the seams with art and tourists before eventually finding my goal. The trick here is to be patient and wait for a ringside seat against the side walls to become available. Then you can relax and admire the beautiful artwork that floats high above you. Also, entertaining is watching the attendants bouncing through the crowd like pinballs to stop visitors taking photos. If you are sneaky, you can capture quite a bit without being noticed. Julie’s visit to Rome with her Mum and sister Tracey was a little more leisurely. They took in pretty much the same sites with the addition of a wander around the litter-strewn streets outside of the Colosseum. They also managed to fall into the trap of visiting a restaurant that didn’t display any pricing, rookie mistake that saw little change from €100. 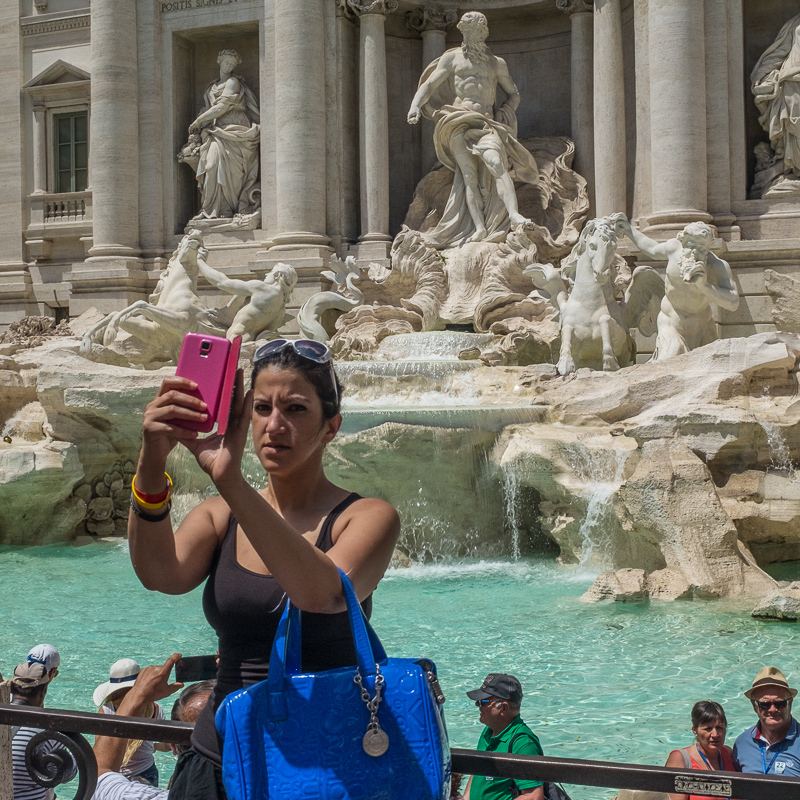 The success of Rome as a tourist destination also has its downside, noise, crowds and litter. For an old timer, it certainly packs a punch but is showing signs of wear and tear. Onto Florence, we were one of the first through the doors when the Accademia Gallery opened for our visit to see Michelangelo’s David. This Goliath of a masterpiece stands 5.16 meters tall (almost 17 foot). The sheer size and brilliance is truly captivating. There are other pieces of art in this small gallery, but all eyes are on David. 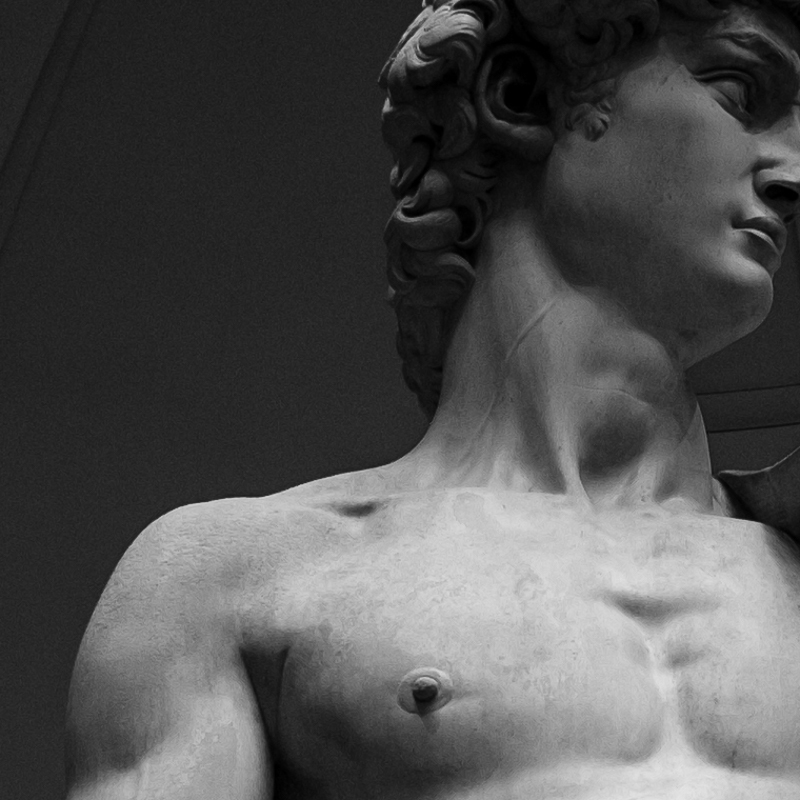 The statue was initially placed in Piazza della Signoria but moved to the Accademia to protect it from the elements and most likely tourists with little chisels. 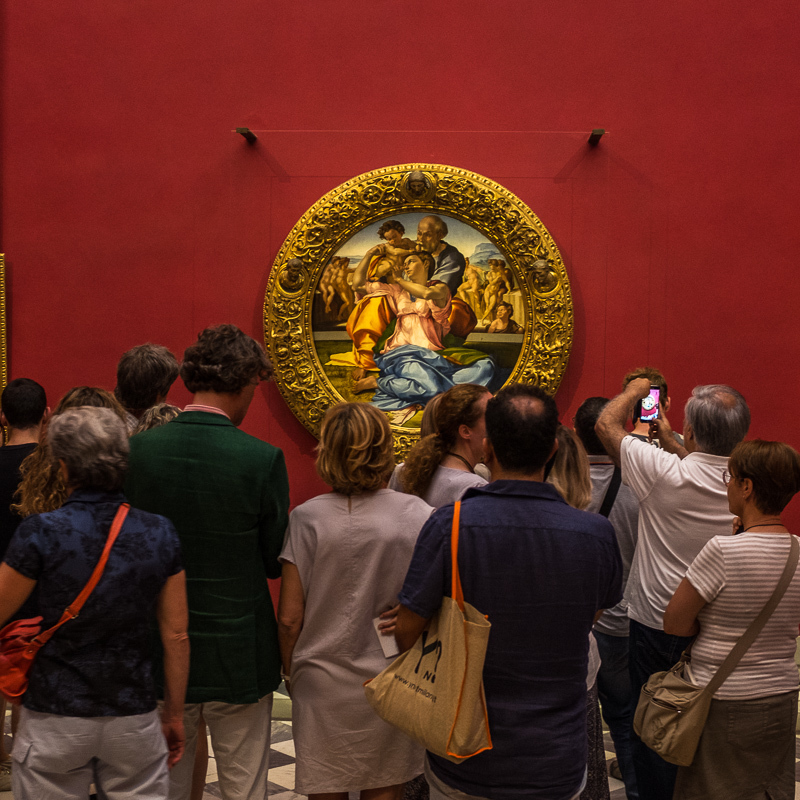 The Uffizi Gallery should be on everybody’s hit list of things to do in Florence. The gallery is on the top floor of large oblong shaped building built in the 16th century. It is home to works from great artists such as Botticelli, Caravaggio, Leonardo da Vinci, Michelangelo, Raphael and many more. We choose to wander at our own speed and didn’t bother with the audio guide. With the culture glass now full to over-flowing it was time for some fresh air before our time slot to climb the beautiful Giotto Campanile (bell tower). Four hundred and fourteen steps up a claustrophobia inducing stairwell. 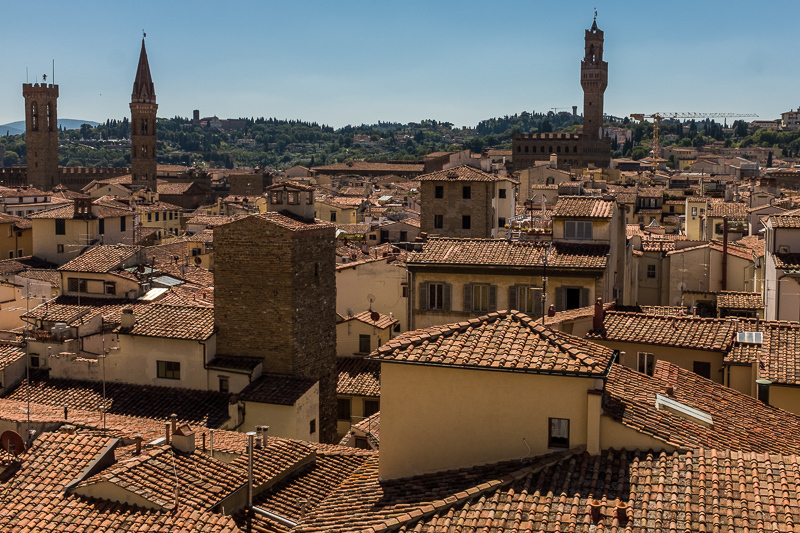 At the top, you are presented with a stupendous 360-degree view of Florence. 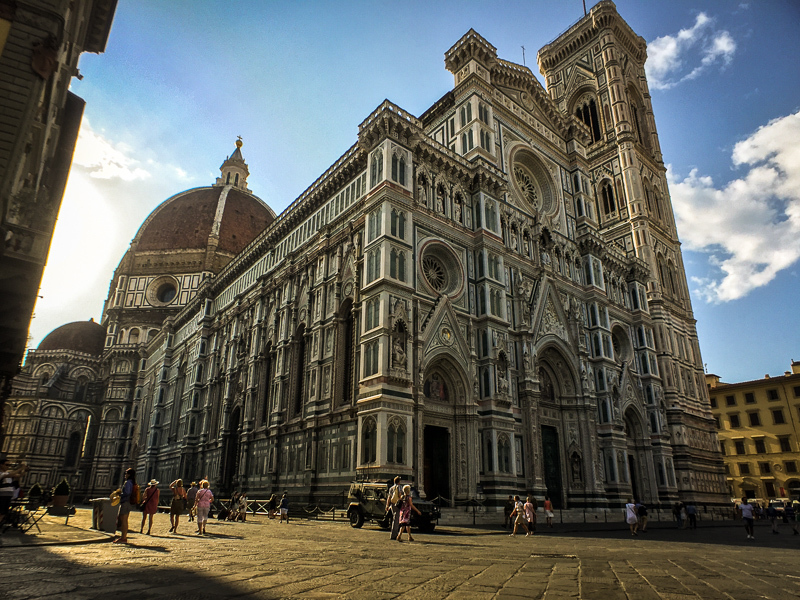 The restaurants and cafes in the Piazza di San Giovanni, where you find the Cathedral of Santa Maria dei Fiori (Florence Cathedral), charge like wounded bulls. Stepping back a block you will find a variety of reasonably priced cafes and bars. It appears that the craftsmanship and creativity were poured into the outside of the Cathedral of Santa Maria dei Fiori, because the inside is as hollow as an Easter egg. 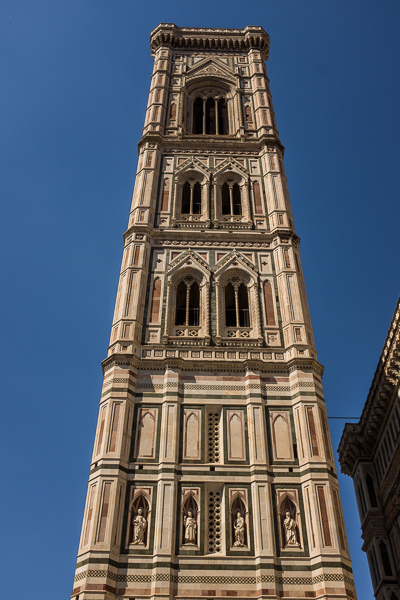 Given that we had already climbed to the top of the bell tower we skipped the opportunity to ascend the Duomo. 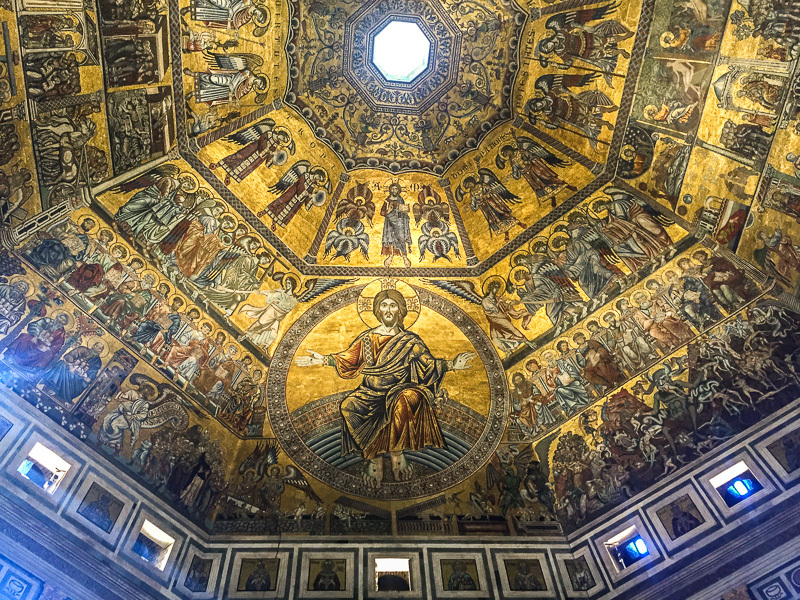 The nearby Baptistry packs a surprising punch. The octagonal building dates back to the 12th century. Inside all heads turn upwards to the magnificent mosaic ceiling. Zig-zagging through town, we made our way up the Poggi Ramps (stairway) to Piazzale Michelangelo for more postcard inspired views of Florence. 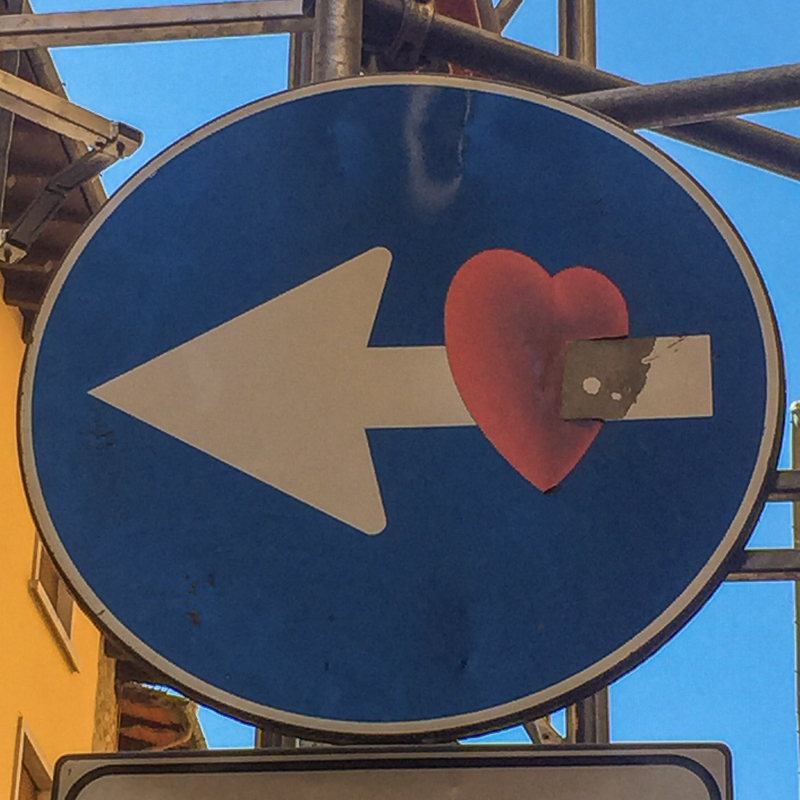 Along the way, Julie started her photo collection of traffic signs that have been skillfully and humorously defaced by the French artist Clet. Wandering back along the banks of the Arno River before crossing the Ponte Vecchio (Old Bridge) the number one landmark in Florence, The bridge dates back to the 14th century and was once lined with butchers shops. These are long gone and replaced with jewellery shops. The swoosh of the meat cleaver replaced with the swish of credit cards. The Ponte Vecchio is the only bridge to survive the German withdraw from Florence during WWII, phew. So who wins out in our Rome vs Florence rumble. In our minds, Rome is a big massive lumbering bruiser, with Florence the leaner and quicker fighter. Each city has a long list of must-see sights. 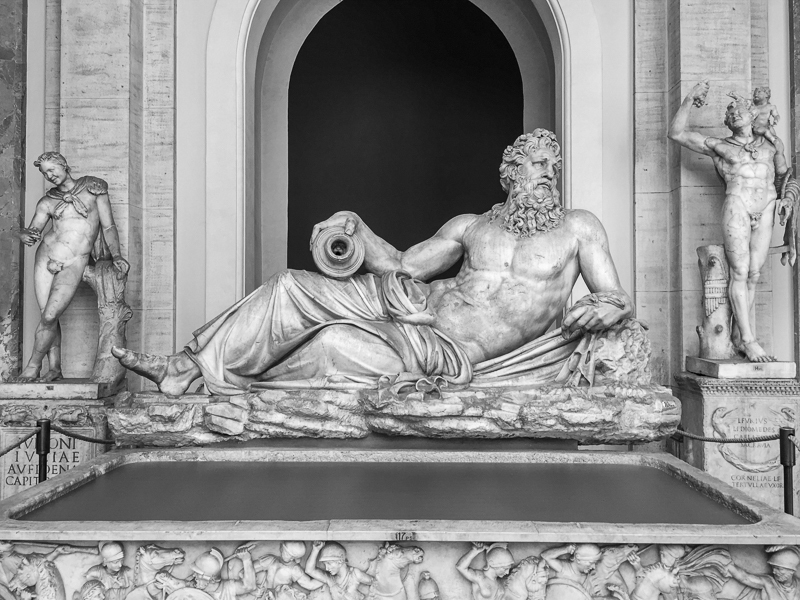 The crowds in Rome were a big negative, especially inside the Vatican Museum. Like faded tattoos, the graffiti and litter can sometimes be hard to look passed. Florence, a former capital city of Italy, is also a big draw for tourists but it seemed cleaner, calmer and more relaxed. 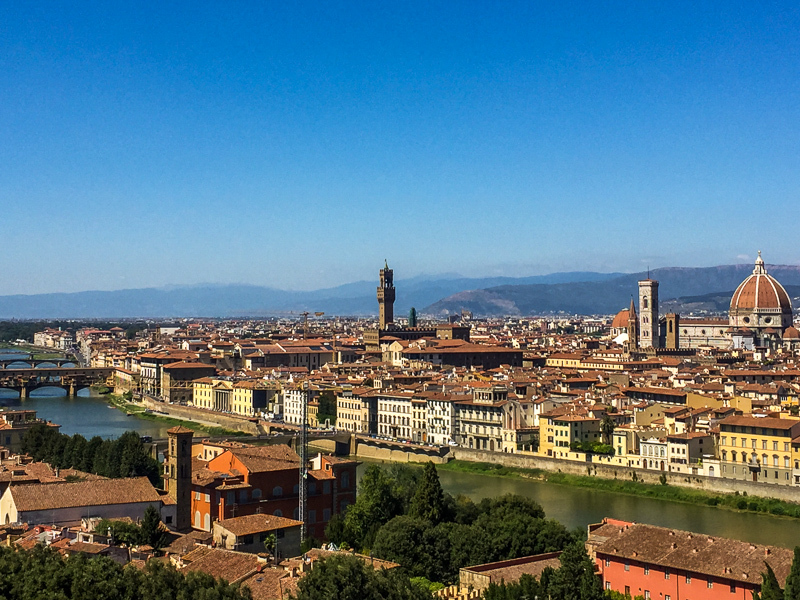 Walking around Florence is easy, as you would expect being a tenth the size of Rome. That said the metro in Rome can get you to most of the major locations. You certainly would need double the amount of time to do justice to all that Rome has to offer compared to Florence. But does quantity win out over quality?